The Friday after the third GOP presidential primary debate hosted by the CNBC network, the Republican National Committee (RNC) suspended its relationship with NBC News. The RNC felt that NBC News did not properly accomplish its sole responsibility to them, which is to ensure that its candidates are given a full and fair opportunity to outline their vision for the future of this country. This was not the case at Wednesday’s debate said Reince Priebus, RNC Chairman, in a letter to NBC News Chairman Andrew Lack. “The CNBC network is one of your media properties, and its handling of the debate was conducted in bad faith,” the letter reads. “We understand that NBC does not exercise full editorial control over CNBC’s journalistic approach. However, the network is an arm of your organization, and we need to ensure there is not a repeat performance”. 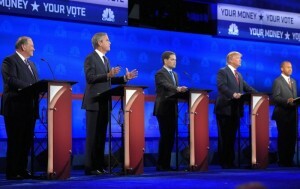 The three main concerns of the RNC, as outlined by Priebus in the letter, were that (1) the debate did not focus on key issues that matter to voters; (2) the candidates were not given opening questions on the economy or finance; and (3) speaking time was not monitored carefully to ensure fairness. “While debates are meant to include tough questions and contrast candidates’ visions and policies for the future of America, CNBC’s moderators engaged in a series of ‘gotcha’ questions, petty and mean-spirited in tone, and designed to embarrass our candidates,” the letter continues. “What took place Wednesday night was not an attempt to give the American people a greater understanding of our candidates’ policies and ideas”. The RNC understands the First Amendment rights and respects them, but they also believe that CNBC has a responsibility to host a substantive debate with serious thought provoking questions. The RNC were not the only ones upset. During the debates, the candidates themselves called out the moderators for their “unfair” and “nasty” questions, and the audience booed the moderators multiple times throughout the night. While the relationship between the RNC and NBC News has been suspended, the RNC did state that this suspension will not affect the following debate on February 26, 2016 that is scheduled to take place on the NBC network, sponsored by NBC/Telemundo. When I first read this story, I really was not surprised. Especially at the beginning of the debate, I did not like the questions being asked. As a viewer I felt that the questions were unnecessary and weren’t getting at any substantive material. Also, the moderators did not have control over the debate to start with so the beginning of the debate did not appear to be a presidential debate, instead it was just people talking over one another and defending themselves, and it was simply kind of chaotic. This story relates to our class because the RNC it is a perfect example of a dissatisfied stakeholder and how they can take action against a company that doesn’t properly represent them. The RNC by definition is a stakeholder of NBC News, and for that reason, the NBC network should look out for the interests of the RNC. However, they failed to do so in this past debate, and had it been worse, it could have cost them a relationship instead of simply a suspension of relations.